The second season of Star Trek: The Next Generation brought about some significant changes to the show. During the first season, the characters were less defined. They seemed more like ciphers that fit the episode storylines than real people. In the second season, the characters came more into their own being. Their personalities were more established and storylines molded around them, rather than the other way around. Two new characters were also introduced this season; one great and one that didn’t quite work. Guinan (Whoopi Goldberg) was a great addition to the Enterprise. The character serves as the ship’s bartender, but she was so much more than that. Guinan was mysterious, wise, and added a non-military perspective to the happenings. On the other hand, the addition of Dr. Pulaski (Diana Muldaur) was not so welcome. Dr. Pulaski was quite a jolt to the series. Gates McFadden, who played Dr. Beverly Crusher, unexpectedly left the show. Having a new doctor so soon seemed strange. Not that Dr. Crusher was an especially beloved character, but she had a definite place on the show. There was sexual tension between her and Captain Picard (Patrick Stewart) and she was the mother of Wesley Crusher (Wil Wheaton). Dr. Pulaski always felt out of place, beyond even what was intentional for her character. It’s clear the character was meant to be a bit grating. She was older than most of the crew and set in her ways. She had an instant dislike and distrust of the android Data (Brent Spiner), which wasn’t going to make her popular with anyone. She came across as kind of a know-it-all who didn’t want to take advice from anyone. It was off-putting. At the very least, Dr. Pulaski added a new dynamic to the show, and allowed it to explore some new territory. With the departure of McFadden they had to come up with a reason for her son to remain on the ship. The idea of a teenage boy staying on one of Starfleet’s flagship vessels without a parent is a little hard to swallow. Actually, the reason they gave was fairly weak. Apparently Wesley cared more about staying on the Enterprise than being with his own mother. It was a little strange given that Wesley was a pretty dutiful son. We just had to accept that he felt the pursuit of knowledge available on the Enterprise was more valuable to him. The show moved on quickly from the subject after it was established that he would stay. Dr. Pulaski was not the only one to have mixed feelings about Data. Questions about how much of a sentient being in his own right were explored this season. Most notably the episode “The Measure of a Man” dealt with this issue. This episode is one of the highlights of this set. It is expanded to include scenes unseen in the original broadcast. The extra footage was edited in based on a VHS tape of the original cut, which had been saved by the episode’s writer, Melinda Snodgrass. The set offers the option of watching the episode with the actual VHS footage edited in and unmixed, unfinished sound. “The Measure of a Man” is a great episode, examining whether Data is property or a sentient being. Season two features some of what I think are the best episodes of the series. A personal favorite of mine is “Samaritan Snare” where Captain Picard, accompanied by Wesley Crusher, must take a trip to a nearby space station for surgery. Both characters learn a little more about each other, and eventually about themselves. While Picard is in surgery, Wesley takes his Starfleet entry exams. There he faces some unexpected challenges, and we learn more about the loss of his father. I felt the episode gave Wesley some much needed emotional weight. We also learn some surprising things about Captain Picard via a dream sequence during his surgery. Season two is also significant for introducing the Borg. In “Q Who?” the mischievous Q (John de Lancie) returns to teach the members of the Enterprise a lesson since he thinks they have become too arrogant and bold in their space exploration. He flings the ship to the furthest reaches of the galaxy, causing a premature encounter with what would become one of their greatest enemies. I particularly like this episode, not only for introducing a great villain, but for great storytelling in general. Guinan, in particular, is developed more as a character, showing that she has more to offer than just being a wise bartender. Of course that was something that had been hinted at previously, but it is solidified in this episode. 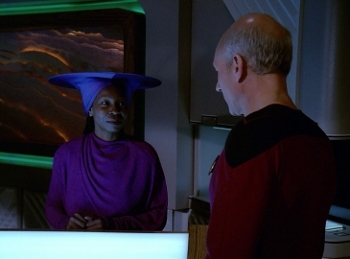 One of my favorite scenes is when Q and Picard are alone in Ten Forward (the ship’s bar) and Guinan pops up from behind the bar to confront Q. Even though her presence on the show became more substantial in this episode, her background became even more mysterious. We learn she had encountered the Borg in her past, as well as the Q Continuum. The good episodes far outweigh the bad this season, though there are a few that I would call weak. One is the disappointing season opener “The Child.” In this one, Counselor Troi (Marina Sirtis) is impregnated by an alien being. She has the child within 36 hours, and he proceeds to grow into a preteen at the same quick rate. The whole episode is just kind of weird, and the emotional ramifications of such an event are not explored in any way. 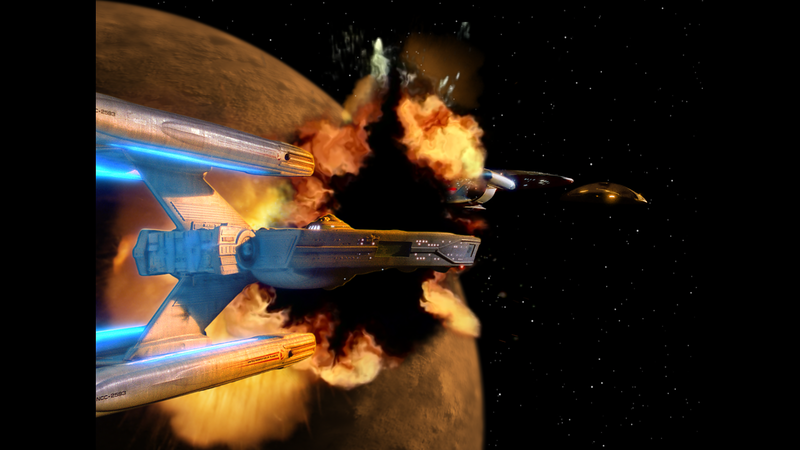 This episode was apparently adapted from a script meant for Star Trek: Phase II, the failed attempt at bringing the series back to television in the year prior to Star Trek: The Motion Picture. Despite many good episodes the season did suffer a little in part due a writer’s strike that gave the season a late start, cutting its episode order by four. The season finale “Shades of Gray” is an uncharacteristic clip show. The episode finds Riker (Jonathan Frakes) dreaming of the events of the season while in a coma. Nonetheless, the season overall is very enjoyable and set the series off on a great path toward the events of the future. There has been some controversy over the video quality of this set. CBS remastered the first season in-house, but the second season was outsourced to another company (HTV-Illuminate). Due to the massive amount of work involved in producing these sets, CBS is only working on the odd seasons. Some have complained that the other company did an inferior job on season two. Honestly speaking, I don’t really see a huge difference between the quality of the first and second seasons. The second season still features vibrant colors and sharp detail that was lacking in the DVD releases. I have not been able to meticulously examine all the special effects yet, but what I have seen looks good. I think most fans of the show will be more than satisfied with the look of the episodes. I enjoyed the special features, especially the cast reunion, “Reunification: 25 Years After Star Trek: The Next Generation. It’s fun to see the cast look back on the show so many years later. 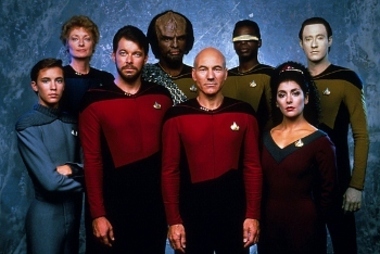 There are commentaries on two episodes “The Measure of a Man” (extended version, and “Q Who?”) A two-part documentary “Making It So: Continuing Star Trek: The Next Generation examines the season in detail. There is also an entertaining gag reel (presented in HD, unlike the old gag reel ported over to the first season’s set). Vintage promos for the episodes highlight the difference in visual presentation between the original broadcast and these Blu-rays. 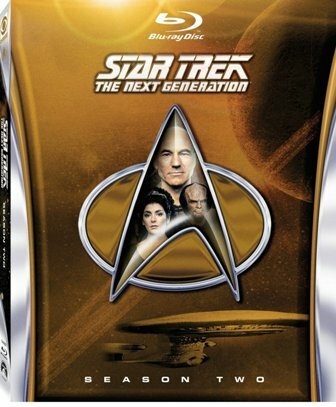 So far I have really enjoyed revisiting Star Trek: The Next Generation on Blu-ray. The episodes look so much better than they ever have. I can’t recommend these Blu-rays any higher for anyone who is a fan of the series or is interested in becoming one.